Dr. Patel was just simply amazing, and the staff had wonderful customer service. This is the type of office you walk-outof feeling truly cared for. Dr. Patel was just simply amazing, and the staff had wonderful customer service. This is the type of office you walk-out of feeling truly cared for. They have amazing customer service and genuine care for there patients. They are very honest, and helpful. I would highlyrecommend. Amruta Patel is a warm and compassionate dentist caring for the community of San Antonio, TX. Dr. Patel attended Marquette University, where she received both her dental degree and her bachelor’s degree. Dr. Patel practices at All About Smiles, where she provides cosmetic braces, endodontic treatments, implants, and veneers, as well as basic general dental services. 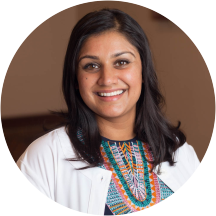 She welcomes patients who speak English, Spanish, Hindi, Punjabi, and Gujarati to her practice. Outside of practicing dentistry, Dr. Patel enjoys spending time with her husband and two dogs. During her consultations, Dr. Patel fully explains patients’ conditions and helps them choose an appropriate treatment plan. She's amazing!! I would highly recommend her!! I don’t usually write reviews but my experience was so overwhelmingly positive that I had to for this place. Dr. Amruta Patel and her staff are unbelievably friendly and welcoming. They are very easy to communicate questions to and are veryunderstanding and were happy to answer all questions and concerns (I’m one of those obnoxious patients who have to have something explained several times before I get it). Dental care has always been such a hassle for me but this dentist and her staff definitely make it easy, comfortable and straight forward. This is definitely where I will be getting cleanings and check ups from now on. Definitely recommend. The doctor and her staff seemed very caring and professional. I felt very safe (not often feel this when at the Dentist) and that they would take good care of me. Entire staff is very nice and easy to talk to/with. Dr. Patel and her staff are amazing. Explained everything throughly and were more helpful and involved than any dentist I've had in the past. Very impressed! Wonderful experience! I especially appreciated the follow up call to see how I was doing after my appointment. Awesome staff, my husband and I were able to have the same appointment day but we couldn’t find a babysitter so we had to bring our daughter there. The staff was very courteous letting us take turns for our appointment, onehas the baby and the other gets their teeth checked. Very awesome! They make going to the dentist FUN! I absolutely loved Dr Patel and her team of hygienists there. Amruta Patel has an amazing personality and makes you feel comfortable. I wouldn't wanna go anywhere else. Their team let me know exactly what was going on, made sure Iunderstood and created a plan for me to come in and make sure I get the right treatment. The office staff and Dr Patel office is very very welcoming , Tammy took me in right away and was so sweet and nice. The office if very nice and warm. They addressed my concerns to a great degree ! DrPatel listens to everything and address what is in your best interest. I highly recommend anyone to this facility. Will be returning for more treatments. I had not been to the dentist in years and was very anxious about going. Dr.Patel and her team quickly put me at ease, helped me get the care I needed ASAP, and were incredibly kind and friendly. Great experience.. right from the front desk to dr every one take care of me so well. Dr Patel was really great and friendly. She made sure I have less pain and comfortable during the process. Definitely recommend. The whole staff was absolutely lovely. I have a personal fear of going to the dentist, even as an adult, and they made everything very easy for me. They explained everything in detail and made sure I was comfortable the whole time. Definitely recommend coming here! Dr. Patel and her staff were so kind and genuine. It made me sad to find them just before I was moving to Dallas. They made special arrangements for me in order to get my crown put on since I wasmoving out of the area. They were wonderful. If it wasn't a 5 hour drive I would continue to use her! I'm super happy with my visit with Dr. Patel. I've never had a dentist very informative like her. She makes me feel like she really cares about my overall health with my teeth and that's what I really like the mostabout her. The staff had amazing customer service as well. I'm very satisfied with my visit today. Dr. Patel and her team (I worked with Mitch and Tammy) provided excellent care. They validated my concerns, addressed me professionally, and gave me great recommendation for my treatment plan. Dr. Patel and all of the staff were wonderful and made me feel really at ease about the procedures that I have to get. As someone who's had a lot of negative experiences at dentists offices before I'm extremely happy Ifound a a dentist that was as friendly and helpful as these guys. I would highly recommend them to everyone! I was really happy about the appointment afterwards. She made me feel relaxed about having to schedule a dental procedure to have done (because my anxiety level increases near time for the situations). All of the staff were very professionaland friendly and showed that they honestly care about their patients, fears, and how to make them feel more at ease about having dental work done. My husband and I's appointment was great. The staff is friendly, compassionate, and very knowledgeable. We checked in and got seen with in 10 minutes. Dr. Patel is so genuine and comfortable to talk with, she gives you her undevided attention and made our visit a great experience. It was a very pleasant experience from start to finish. Found my dentist for life. My first new patient adult visit went well! No complaints! She was very helpful and nice. I missed judge them there but I had to apologize right away. Treatment was done . Tammy, the super nice lady at the front is amazing!! !